A trigger finger (aka Stenosing Tenosynovitis) is caused by inflammation involving the pulleys and tendons that flex fingers. Pulleys are a series of tunnels that tendons travel though to hold the tendon against the bone. The inflammation leads to narrowing of the pulley causing the tendon to get stuck. This leads to difficulty in flexing or extending the finger. These symptoms can be very painful and lead to functional hand problems. Patients with trigger fingers experience pain in the base of the finger/palm. As it progresses, the patient feels a clicking sensation in the middle knuckle with motion. Severe cases can cause the finger to be locked in a flexed or extended position. Trigger fingers are more commonly seen in patients with diabetes, rheumatoid arthritis, and gout. The goal of treatment is to eliminate the catching of the tendon. Mild trigger fingers can be treated with anti-inflammatory medications and decreasing activities that put pressure on the area. Steroid injections around the tendon have been shown to be effective in alleviating the trigger finger/thumb. Surgery is recommended for patients who have failed non-surgical treatment. Surgery is an outpatient procedure that surgically opens the pulley to eliminate the catching of the tendon and allows it to glide freely. Patients experience some discomfort, tenderness and swelling after surgery. But, normal use of the hand is allowed once patient comfort permits. If you have been diagnosed with a trigger finger/thumb, or think you might be suffering from one, feel free to contact our office to schedule an appointment. DeQuervain Syndrome is caused by inflammation of the extensor tendons that allow extension of the thumb. The thumb tendons run through a tunnel in the radial wrist (thumb side of the wrist). Inflammation affecting both the thumb tendons and the soft tissue that makes up the tunnel leads to radial wrist pain and painful thumb motion. These symptoms can become rather severe and significantly impact hand/thumb function. The exact cause of DeQuervain Syndrome is not known. It is commonly seen in new mothers typically 4-6 weeks after delivery, possibly due to the position of holding a newborn, hormones and swelling. However, DeQuervain Syndrome is seen in both men and woman of all ages. There are some variations in the anatomy around the thumb that have been shown to increase the risk of DeQuervains. Initial treatment of DeQuervain Syndrome involves anti-inflammatory medications and thumb/wrist splinting. Steroid injections in the tendon tunnel have been shown to improve or alleviate the symptoms in most patients. For patients who have failed conservative treatment, a surgical procedure is available to treat the condition. The surgery involves opening up the tunnel and making more room for the tendons to glide. If you have been diagnosed with DeQuervain Syndrome, or feel you might have this problem, fell free to contact our office to schedule an office visit. Cubital Tunnel Syndrome is a relatively common condition caused by compression of the ulnar nerve at the elbow. The ulnar nerve passes around the inside of the elbow at the area commonly known as the “funny bone.” Significant compression of this nerve can cause pain at the inside of the elbow or into the hand, numbness and tingling into the small and ring fingers and generalized hand weakness. These symptoms can become rather severe and can impact hand function and quality of life. There are multiple causes for the increased pressure on the nerve. The inside of the elbow does not have a lot of padding. Therefore, continuous and repetitive compression by leaning on the inside of the elbow against a table can cause the symptoms. Additionally, the pressure on the nerve is increased by prolonged elbow flexion. Since we all sleep with our elbows flexed, this can also cause increased pressure on the ulnar nerve. Increased connective tissue and muscle variations can also lead to the nerve compression. Diagnosis of Cubital Tunnel Syndrome is made by a detailed clinical examination. A nerve test called an Electromyography (EMG) and Nerve Conduction Study (NCV) is commonly ordered to confirm the diagnosis and assess severity. The nerve test also rules out other nerve problems like a pinched nerve in the neck. Treatment of Cubital Tunnel Syndrome largely depends on the severity of compression. Mild compression can be treated with conservative treatments like avoiding leaning on the elbow or sleeping with the elbow straighter to limit the pressure on the nerve. If the nerve compression is more severe or does not improve, surgical treatment does exist to take the pressure off the nerve. Occasionally, the nerve may be moved to the front of the elbow to further decrease the pressure. The surgery usually has a 4-6 week recovery process with light activity during that time period. Overall recovery largely depends on how severe the nerve was compressed. Pain and numbness/tingling may improve quickly, or take more time. Strength of the hand/wrist takes months to recover. Patients with severe ulnar nerve compression may not have full nerve recovery. Delayed evaluation and treatment of ulnar nerve compression is never recommended. If you were diagnosed with, or think you might have Cubital Tunnel Syndrome, please feel free to make an appointment with our office for an evaluation. Ganglion Cysts are very common lumps that occur on hands and wrists that arise from joints or tendons. The common locations include the top and palm side of the wrist, palm side of fingers, and near the finger nail. A Ganglion Cyst is a sac filled with clear fluid or gel. These masses are no cancerous and do not spread. They may change in size and even disappear on their own. Some Ganglion Cysts are painful due to pressure on surrounding structures (tendons, nerve or blood vessels). Ganglion Cysts occur in all ages and the cause is largely unknown. Diagnosis of a ganglion cyst is made by clinical exam and location. Frequently these cysts are treated non-surgically. They seem to disappear spontaneously if the patient waits long enough. If the mass becomes painful or problematic the ganglion can be aspirated with a needle in the office. However, recurrence of the cyst is rather common after aspiration. Surgical treatment is available which consists of removing the cyst along part of the joint capsule or tendon sheath. Even with surgical removal, ganglion cysts still recur 10-15% of the time. If you have been diagnosed with a Ganglion Cyst, or have noticed a lump on your wrist or hand, feel free to contact our office to schedule an evaluation. Carpal Tunnel Syndrome (CTS) is a condition that causes pain tingling and numbness in the hands. It affects .1% of the population and occurs 3x more often in women than in men. CTS is characterized by pain, tingling and numbness in the hands that often is worse at night, worse with the arm elevated such as when driving a car or a motorcycle and worse after increased activity levels. Patients often wake at night or in early morning and have to shake their hands or run them under warm water to relieve their symptoms. The diagnosis of CTS can largely be made on the basis of a good history and physical exam. However, to obtain an accurate baseline of the function of the median nerve and to better predict ones prognosis after CT surgery a tests called electromyography and nerve conduction studies should be done. Treatment options for CTs range from splints for mild CTS to injections for temporizing relief to surgery for complete relief. Surgery, whether through a mini open or endoscopic approach is very quick to recovery from. Patients who work in an office can return to work the next day, while laborers typically take three to four weeks to return to full activities. Basal Joint Arthritis (BJA) is arthritic pain at the base of the thumb. Basal joint arthritis is degeneration of the joint between the metacarpal of the thumb and the opposing trapezium bone. Basal joint arthritis causes pain with pinching, gripping, open jars, turning car keys and other activities such as using a can opener. BJA occurs 4x more frequently in women than in men. BJA is diagnosed on the basis of x-rays and physical exam. The treatment of BJA is based on the severity of the condition. Treatments range from splints, to non-steroidal anti-inflammatory drugs to injections to surgery. Treatments are very effective for eliminating pain and loss of function associated with this very common form of arthritis, which is the most common form of arthritis in women. Dupuytren’s Disease is not actually a disease but rather a genetic condition that causes thickening in the form of lumps and cords on the palm side of the hand that can cause loss of motion and difficulty straightening the fingers if left untreated. Dupuytren’s effects men more than women and is most common in those from northern European descent. The diagnosis of Dupuytren’s is based on physical exam findings alone. Unfortunately, stretching, medications, and therapy have no effect on the progression of Dupuytren’s. The treatment of Dupuytren’s in the past has largely consisted of surgical excision of the diseased, contracted cords. Surgical treatments have had very good overall results. However, in the past few years, treatment has begun to shift to the use of collagenase injection’s to simply dissolve the diseased scar tissue. This treatment had been amazing successful and will likely replace the need for surgery as the use of this technique becomes more perfected. Tennis elbow is also known medically as lateral epicondylitis. Tennis elbow is very common in males and females who are 30-60 years old. Tennis elbow is due to the degeneration, inflammation or partial tearing of the common extensor tendon of the wrist and fingers where they originate from the outside bony prominence of the elbow known as the lateral epicondyle. Less than 10% of people who have experienced this pain have ever picked up a tennis racket. Evaluation begins with physical examination and x-rays from three different views. This is often all that is needed to diagnose your elbow pain. On occasion an MRI or ultrasound may be needed to further evaluate the tendons and ligaments of the elbow. Treatment may consist of oral medications’, exercise at home or with a therapist, bracing, injections and on occasion, surgery if required. 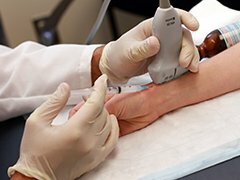 A number of minimally invasive techniques are available for the treatment of tendon injuries if required including percutaneous tendon debridement or injection of platelet rich plasma. If you are experiencing ongoing elbow pain which limits your normal activities feel free to contact our office for a complete evaluation and treatment recommendations. The rotator cuff is a complex of four muscles, which originate on the shoulder blade and then change into a thick broad flat tendon before inserting in a cuff like fashion around the ball of the humerus. They provide stability and mobility for the ball and socket joint. Aggravation of these tendons may cause inflammation, degeneration or partial or complete tearing. Calcium may grow within the tendon itself, causing a calcific tendonitis, which may cause excruciating pain. Pain is often felt when reaching overhead, putting on a shirt or coat, when reaching for a seat belt or when picking up a purse or brief case from your cars passenger seat. While pain from the rotator cuff may be felt in the front and side of the shoulder, it is often felt down on the outside part of the upper arm. Pain may be more severe at night and cause disruption of sleep. Evaluation begins with physical examination and x-rays from three different views. This is often all that is needed to diagnose your shoulder pain. On occasion an MRI or ultrasound may be needed to further evaluate the soft tissue structures of the shoulder. Treatment may consist of oral medications, exercise at home or with a therapist, injections, and on occasion, surgery if required. Most surgery is done through minimally invasive arthroscopic techniques. If you are experiencing ongoing pain in the shoulder with difficulty with range of motion, weakness or difficulty sleeping, feel free to contact our office for a complete evaluation and treatment recommendations. Frozen shoulder known medically as adhesive capsulitis is a shoulder condition that tends to affect women between 40 and 60 years old. It has a very high prevalence in individuals who have diabetes. Frozen shoulder proceeds in its natural progression through three stages, a freezing, a frozen and a thawing stage. This process takes 15-18 months to complete. In the early freezing stage pain is the chief complaint as motion limitations are just beginning. In the frozen stage motion worsens and the shoulder stiffens and loses its normal mobility. It may become impossible to wash ones hair or fasten ones bra behind the back. Though the thawing stage, motion slowly returns however, a significant number of people are left with ongoing motion restrictions or pain. Evaluation begins with physical examination and x-rays from three different views. This is often all that is needed to diagnose your shoulder pain. On occasion an MRI or ultrasound may be needed to further evaluate the soft tissue structures of the shoulder. Treatment is aimed at restoring motion. Frequent stretching is critical. Physical therapy consisting of stretching and joint mobilization plays an important role in resolution of these symptoms. In resistant cases manipulation under anesthesia or arthroscopic capsular release may be warranted to restore motion. Dr. Placzek has published numerous studies on a technique of manipulation called translational manipulation under anesthesia which restores the normal rolling and gliding mechanics of the ball and socket joint, stretching the capsule in a safe manner, while offering rapid resolution of symptoms. If you are suffering from ongoing shoulder pain with progressive loss of range of motion, feel free to contact or office for a complete evaluation and treatment recommendations. Hand Pain: The hand is an intricate region of bones, ligaments, tendons and nerves. Hand pain is a relatively common problem that can affect people of all ages. The pain could present itself after injury/fall, or slowly over time without an exact cause. Common causes of hand pain involve nerve compression (eg carpal tunnel syndrome), tendonitis, arthritis, or sprains/fractures after injury. The work-up for prolonged or excessive hand pain should be performed by a hand surgery specialist. The evaluation frequently involves a detailed history and clinical exam followed by hand x-rays. Additional work-up involving blood work, nerve testing (EMG/nerve conduction velocity), or MRIs may be warranted in specific cases. Treatment for hand pain largely varies on the specific diagnosis. Options for treatment could involve simple interventions like anti-inflammatories, splinting and/or occupational therapy. However, more extensive treatment may be necessary using steroid injections or a surgical procedure. If you are experiencing significant or prolonged hand pain that is interfering with the activities you enjoy, feel free to contact our office to schedule an evaluation.